Though expected to quadruple within a couple of months, the worm hoard was a little thin in December. We wanted our magazine photos to squirm and teem with the critters, but there were only 15,000 in a twin-bed-sized bin of food waste from the new dining facilities in Ullman Commons. “You’ve just gotta find the melons. That’s what they like,” explained Jake Derksen, a senior biology major. Dozens of creatures nodded. The worms live out past the softball field in the SEEd Project Garden, under a shady enclosure in a bin that can accommodate 60 to 80 pounds of them. The initiative by Derksen and religion professor Sam Thomas, which won an Environmental Sustainability Award last year from then–state Sen. Fran Pavley, is another step toward a campus food system that one day could require few products from outside. 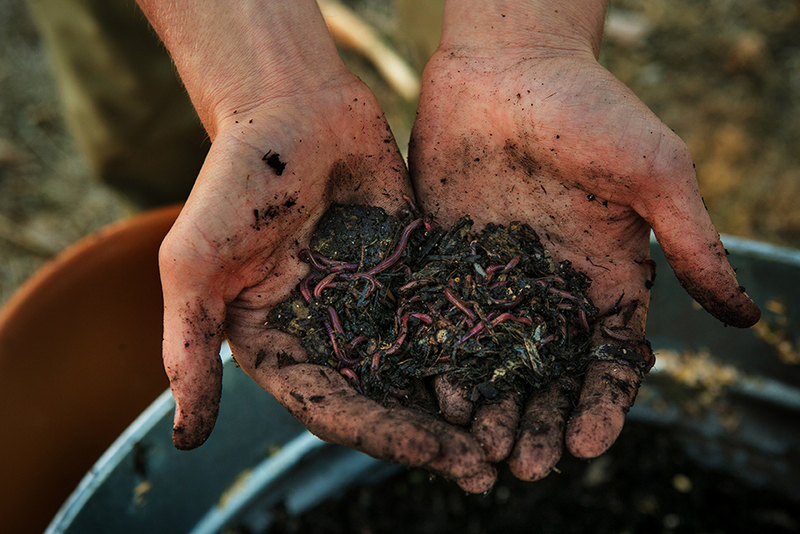 It converts garbage into worm castings (or worm poo) that can be used as a soil amendment. Derksen visits the north campus location every day. “I almost felt like I wasn’t working when I was doing this stuff. This is what I do for fun and work now,” he said. In addition to the SEEd Garden vermicomposting bin, which was accepting about 30 pounds of food waste daily, Derksen has his own small bin going, of the type used in home composting. For his final research project, he measures variations in temperature, moisture and other conditions to find out where worms do their best work.